Walk a small distance from Stirling centre and enter the main park from Ethel Street or Branch Road. Within minutes you find yourself in a peaceful valley, surrounded by natural vegetation. Walk a little further and you arrive at a reed fringed wetland – Lake Woorabinda. Continue on and you enter a cool woodland of stringy bark eucalypts and other native shrubs. 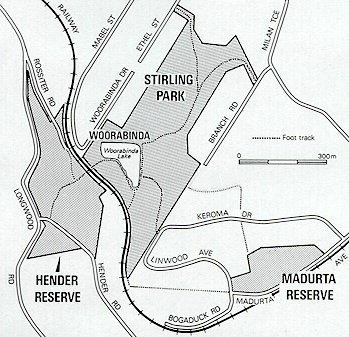 four areas: Stirling Park, Woorabinda, Hender Reserve and Madurta Reserve (walkways connect Madurta Reserve with the main park). The park is a valuable community resource with opportunities for recreation and education. With local Council assistance the Friends of Woorabinda Bushland Reserves Inc. have developed a management plan for the park. The work of dedicated volunteers, who carry out regular care and maintenance, is vital to the successful implementation of the plan and the protection of this important water catchment. 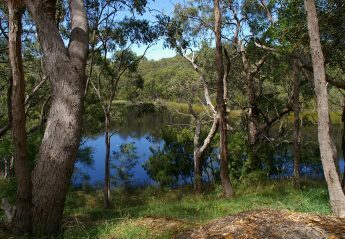 The Friends of Woorabinda Bushland Reserves Inc. are committed to the preservation of the park in perpetuity. If you share this vision, why not join the Friends? Want more information?